All dates for Revolution 3 Tour posted! Our last date with STP, Bush and The Cult for the Revolution 3 Tour has been announced! We will see you in Atlanta, GA @ STATE BANK AMPHITHEATRE AT CHASTAIN PARK on August 7th! Thank you Stone Temple Pilots and all of our new friends! Well, we finished our last date with STP on Friday June 1st in Lincoln, NE. What a night! Thank you Lincoln and thank you to all of the great cities we got the honor to play for: Albuquerque, Nashville, Chattanooga, Memphis, Wichita, Clive, Boulder! We had an amazing time and did A LOT of driving to get to meet all of you and it was more than worth it! We appreciate each and every one of you and we hope everyone will keep in touch! Thank you for being so supportive! Just booked…a show with our friend Jack Evan Johnson @ The East Room in Nashville, TN on Monday May 21st. Also joining us for the evening will be Paul Nelson and Dylan Lancaster. This will be our first time out there and we are pretty stoked to be playing! Come down and check it out. Albuquerque…we will be in you. May 19th we will be playing at Moonlight Lounge in ABQ. Let your friends know and also let them know that some cool local talent will be playing as well: The Talking Hours, Manhigh and Arcade Rivals. Will be good to finally play out there, see you soon! 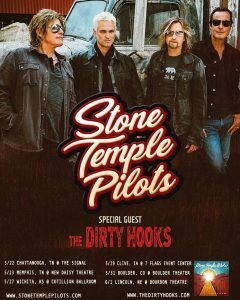 Just released today, we have added on 2 more dates to the Stone Temple Pilots, Bush and The Cult Revolution 3 Tour! Is just around the corner, starts May 22nd. Will we see you there??? Looking forward to meeting all of you! 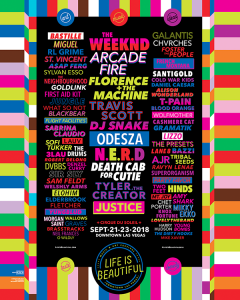 The Dirty Hooks @ Life is Beautiful Festival 2018! !